Large 2 Sided Hanging Oval Address Sign - - personalized 18" wide oval address plaque. Made in USA. The same address appears on both sides of the sign. Designed to hang from the optional bracket shown in Related Products. On a one-line sign, Line 1 holds up to five large 5" characters. On a two-line sign, Line 1 holds up to five 4" characters, and Line 2 holds up to 17 smaller characters. If you are using just one line, please leave the Line 2 input box empty. Custom made with your address and color scheme selection. 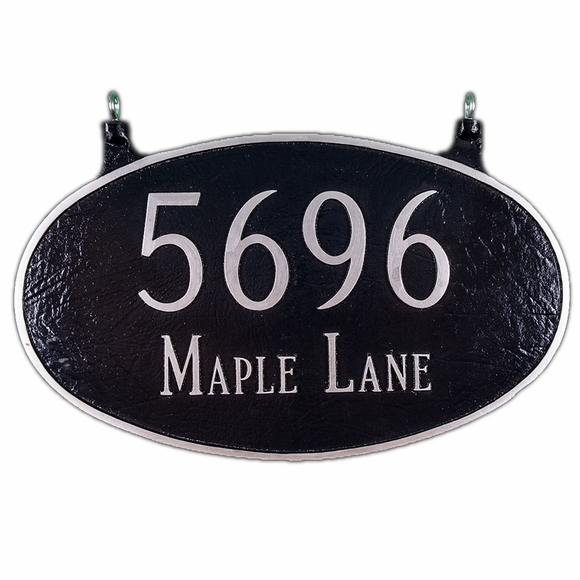 Hanging aluminum two-sided address sign comes in 26 different color combinations. Address shown in sample sign above: 5696 Maple Lane. Made in the USA. Looks great and well made! We chose white with black lettering for better night visibility since our street lacks lighting. Arrived sooner than expected.